What's The Point Of a Round or Oval Kitchen Island? Kitchen islands tend to come in one shape: rectangular. While these long-but-narrow islands are functional and fit well within the skinny confines of most kitchens, it is visually refreshing to see islands with a few curves to them. In fact, rounded kitchen islands do have some added functionality that rectangular ones do not--as we will see in this article. The pictured island comes from UK-based Chalon. 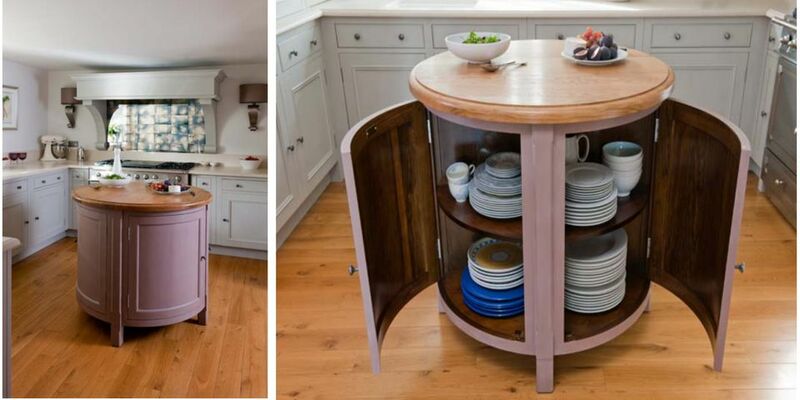 One aspect of their multi-faceted business is to handcraft its own freestanding kitchen furniture pieces. Those two front doors open up, spacecraft-like, to reveal ample storage for plates, pots, and glasses. For its small, round shape, it's deceptively large inside. This is another Chalon creation, similar to the previous circular island, except this one is elongated to form an oval. The counter is thick, highly-polished hardwood. The reason for the long shape is to give the cook plenty of room to prep the dishes, as well as to give space for a couple of casual diners at the far end. As with Chalon's circular island, the doors on this one are curved and open outward to provide plenty of storage space. Placement of the island is perfect. With the sizable skylight directly above, the need for artificial light is drastically reduced. This is a more conventional kitchen island with one rounded end. The bottom section is constructed out of base cabinets, with a warming oven added into the array. The countertop is an engineered stone like Caesarstone, one end cantilevered to accommodate two backed stools for casual dining. Because stone counters are fragile, the bottom is undoubtedly supported by braces. Besides adding dining functionality, this type of kitchen island breaks up the straight lines and rectangular shapes that tend to dominate kitchens. Note the unique, exposed tubular style hood vent above the stove. Where possible, the large wall cabinets are shoved as high as possible, providing the maximum amount of cabinet storage space. In other instances, open cabinet soffits are dressed up with the addition of crown molding nailed to the upper edge of the cabinet. These are two angles on the same, large kitchen island. Conventional wall counter space in this kitchen isn't the best: it's broken up into two sections, and it's limited. Thus, this island needs to work twice as hard. A double-basin sink placed mid-section in the island provides for prepping food and washing up. Tucked away below the rounded end of the island is plenty of storage for unwieldy appliances and cookbooks. The engineered stone counter extends not just over the rounded end, but over one of the lengthwise sides of the island, providing space for four dining chairs. In this kitchen island, one of the lengthwise sides is rounded and protrudes slightly outward to accommodate two diners. With the double-basin sink placed mid-section, this is a lovely arrangement because it allows for the cook to prep food at the sink and converse with someone sitting in the dining chairs. Pendant lights placed low over the island provide lots of light. Textbook kitchen triangle arrangement of stove, sink, and fridge. Glass-fronted wall cabinets act as display cases for pretty items. Electrical receptacles generously sprinkled across​ the counter area.